After year 1 each successive year that you renew is $ 59.00 per year and all of the updates, upgrades, replacement, and tech support above still apply. Check safety paper with 3 checks per page. Quicken compatible business checks. 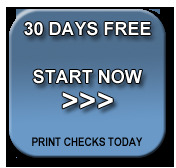 Print as 3 checks or print a top check and two receipts - your choice. You can purchase the paper from us or from your local supply stores.